Tamara Hubbard is one of the two co-founders of the sanctuary. Her life before the sanctuary created a platform for her dreams to become a reality. Since she was a little girl she has always felt a deep connection to animals always rescuing the unwanted and neglected and providing them with safe haven. She went on to become an advocate for animal rights and a practicing ethical vegan. Tamara spends every day working with the animals here in sanctuary helping them to heal from their past and keeping her promise to make the rest of their lives the best of their lives. Coral is the Co-Founder of Santuario de Karuna. She is a Licensed Massage Therapist since 2008, and works in private practice as an Animal Reiki Master and Animal Communicator. She is passionate about her work with animals. She switched to working mostly on animals in 2012. Her work with animals has been very enlightening and inspiring for her. In Sanctuary, she is able to learn and to teach, to love and be loved and to know that she is home. 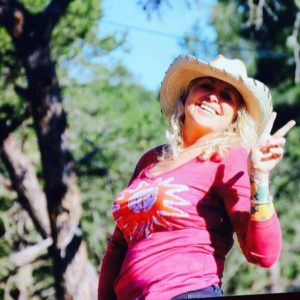 Kim is a mama, educator, artist, folk herbalist, nature lover and yoga movement therapist. She has a BA in socio-cultural anthropology + fine arts and an MEd. in multi-cultural education. She has been a dual-language elementary school teacher on the US-Mexico border, taught ceramics, ephemeral art and sculpture, and was a vice-principal and instructor at Laxmi International School in Gujarat, India. Additionally she has worked with non-profits, developing and coordinating educational curriculum, programs and outreach, as well as grant writing, media and marketing. Lisa is on the board of directors for Santuario de Karuna. She has been with the sanctuary since the very beginning. In fact, she was there when Karuna first came home. She is an animal lover and advocate for animal rights. Lisa believes they are all someone, not something. She lives in Albuquerque with her husband Chris and their three dogs, Moxie, Max and Baxter. Lisa is originally from the Boston, MA area and has a BS in Accounting and is a CPA. She is also one of the organizers of the local Albuquerque vegan group Abq-Vegan. Karla and her husband, Victor, have four children. They co-founded a support group for vegans, vegetarians and those interested in the lifestyle, including outreach through social media, organizing potlucks and viewings of documentaries and presentations with a vegan message. 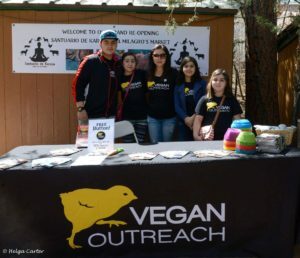 Together, they plan, create and organize various types of events with the purpose of reaching and educating non-vegans about this compassionate lifestyle. Previously retail business owners, they´ve now dedicated their lives to help other people become aware of how daily choices affect animals, our health and the planet. Karla volunteers with various animal advocacy organizations such as Vegan Outreach and Mercy for Animals. She is dedicated and passionate about helping animals. Her dream is to one day see a world in which all animals are treated equally with respect and kindness. Joy is a mother, speech therapist, and animal advocate. She has a passion for working with children and animals. She has been a speech therapist for the last 10 years working with children of all ages in the public schools, in clinical settings, and in their homes. She first became involved in animal welfare in 2011 and has been regularly volunteering for several animal shelters and rescues ever since. Over the years, she and her family have enjoyed fostering many animals in need and helping them to find loving homes. She has also served as volunteer coordinator in shelters and rescues, matching compassionate people with the best way they can help animals in their own communities.